What breeds of dog do the Alaskan Klee Kai originate from? The Alaskan Klee Kai breed originates from the Spitz family and is very similar to an Alaskan Husky dog. What height do Alaskan Klee Kai Grow To? The dogs usually grow to around a maximum height of 17 inches. The Alaskan Klee Kai was developed in Alaska by Linda Spurlin and her family, to be a companion-sized version of the Alaskan Husky. From the early 70’s through 1988, the Spurlins carefully selected dogs who met their high standards for appearance and soundness. In 1988, they made the Alaskan Klee Kai available to others. Mrs. Spurlin originally called her husky breed the “Klee Kai” but in 1995, it was changed to “Alaskan Klee Kai.” The Alaskan Klee Kai is still extremely rare. The name was recognized by the United Kennel Club January 1, 1997. The most distinctive characteristic of the Alaskan Klee Kai is the facial mask which must be clearly visible due to contrasting colors. The full face mask is the most desirable. The Alaskan Klee Kai is a small version of the Alaskan Husky with a wedge-shaped head featuring a striking masked face, prick ears, and a double coat. The length of back is just slightly longer than the height. The tail is well-furred and curls over the back or to either side when the dog is alert or moving. Toy size Alaskan Klee Kai are up to and including 13 inches. Miniature Alaskan Klee Kai are over 13 inches high and up to 15 inches high. Standard Alaskan Klee Kai are over 15 inches high and up to 17 inches high. 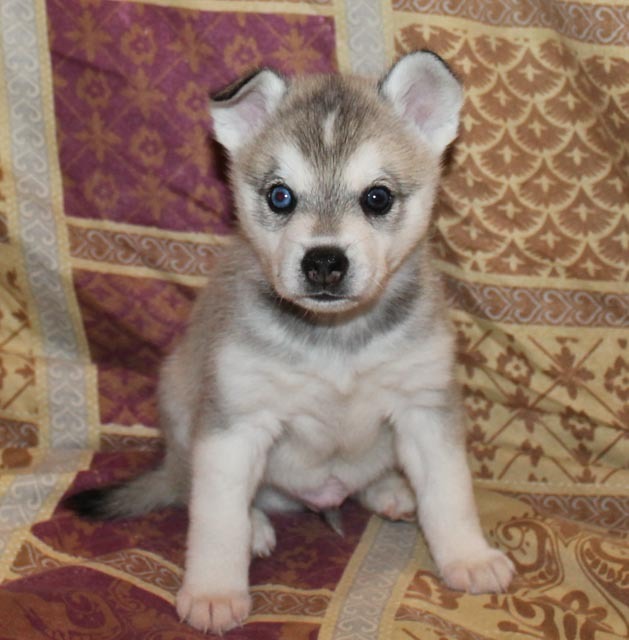 Alaskan Klee Kai come in four main color varieties. Black and White, which can appear with stark contrasts or with a more dilute diffusion of the colors; Gray and White, which comes in several variations; Red and White, which appears either as a cinnamon or a dark auburn, or shades of white. Alaskan Klee Kai eyes can also come in variety colors. They can be blue, brown or green. You can have bi-eyed which is eyes of different colors like one blue, one brown. You can also get parti-eyed which is a mixture of two colors in one eye. So you can have a blue eye on the top and brown on the bottom half of one eye. The Alaskan Klee Kai is a highly intelligent, curious and active breed. Unlike Siberian Huskies, whom they closely resemble, Alaskan Klee Kai are typically standoffish and cautious around unfamiliar individuals, which causes them to excel as watchdogs. Because of their inherently reserved disposition in the presence of strangers, continual socialization throughout their life is highly encouraged. They are moderately active so some daily exercise is recommended. They do well in an apartment if you spend some time playing, walking or letting them play with other dogs. They can be a great family dog if raised with properly raised children. This breed is likely to tolerate being mistreated (poked at, pinched, bullied) by children and may respond by nipping them. Even so, they make great pets. Because of their intelligence they do well in obedience classes and have a high drive to please their owners which helps them to excel in this area as well as many other types of activities. Another such activity is agility in which the AKK almost seems to have been bred to take part in. If you have an Alaskan Klee Kai that is highly active, this is a great way to help them use some of that up. Your Mini Husky will be as active as you are. Whether it’s a ten minute walk, playing with you or another dog in the yard or a 5 mile jog the Alaskan Klee Kai just wants to be with you. Most Klee Kai will seldom require a bath. As in Siberians and unlike short haired dogs who shed all year long, the Klee Kai blows their coat twice a year. Of course, the size of the dogs limit the amount of fur blown. It is best to groom the dog on a regular basis during this time. Some of the longer haired dogs can become matted if not groomed. Most will assist the loss of hair by rubbing against things such as fences.